Updated: March 14, 2013 at 04:12 p.m.
Wes Welker (left) has eclipsed 100 catches in five of the last six years, but Danny Amendola is four years younger. Wes Welker's exit from the New England Patriots for greener pastures with the Denver Broncos sent shockwaves through the NFL on Wednesday afternoon. But it didn't take long for the Pats to lock up a replacement in the slot, as news broke of a five-year deal with Danny Amendola just a few hours later. Adding Welker to a lineup that already features a pair of young, athletic playmakers in Demaryius Thomas and Eric Decker makes the Broncos' aerial attack one of the most formidable in the NFL. Welker remains the best slot receiver in football; his ability to win between the hashes is unrivaled. Peyton Manning certainly will take advantage of Welker's skills against inferior nickel corners. If opponents try to neutralize Welker with double coverage, Thomas and Decker can feast on the isolated matchups that result on the perimeter. Thomas and Decker both showed they can take over as the primary option in the passing game; Welker's arrival will just provide them with more chances to cash in on big-play opportunities. Welker's superb running skills will make the Broncos' comprehensive wide receiver screen package one of the most featured concepts in the league. The Broncos routinely rely on the screen game to offset the various blitz tactics opponents use in their attempts to get after Manning. Welker's experience, explosiveness and elusiveness as a former punt returner make him a threat to turn quick screens into big gains and first downs on the perimeter. Thomas and Decker, meanwhile, also have exceptional running skills. The Broncos can befuddle opponents by using an assortment of screens from a variety of formations to get the ball to their most dangerous playmakers in the open field. Overall, the addition of Welker makes the Broncos' offense more diverse and explosive. Few opponents will be able to match up effectively on the perimeter, meaning the Broncos will have a significant edge over the rest of the AFC. The Patriots needed to find a receiver capable of doing Welker's dirty work over the middle; Amendola is a worthy replacement. While he is not as accomplished as Welker, the former St. Louis Rams wideout is a polished route runner with the savvy and quickness to give opponents headaches from the slot. Plus, he comes to New England with some familiarity of Josh McDaniels' system after working under the offensive coordinator in St. Louis two seasons ago. With Amendola ready and willing to slide into Welker's old spot, the Patriots' offense won't skip a beat in 2013. The truth is, much of Welker's success was a byproduct of playing in a great system directed by arguably the best quarterback in football. Brady's efficiency and effectiveness as a quick-rhythm passer helped Welker thrive as a slot receiver. Brady routinely delivered pinpoint passes within the strike zone, allowing Welker to make plays against tight coverage. Of course, Welker deserves credit for creating separation from opponents with his remarkable stop-start quickness, masterfully setting defenders up with an assortment of stutter-moves and head fakes. However, Welker's quickness has diminished in recent years; Brady had been waiting longer on his primary target to uncover in key moments. 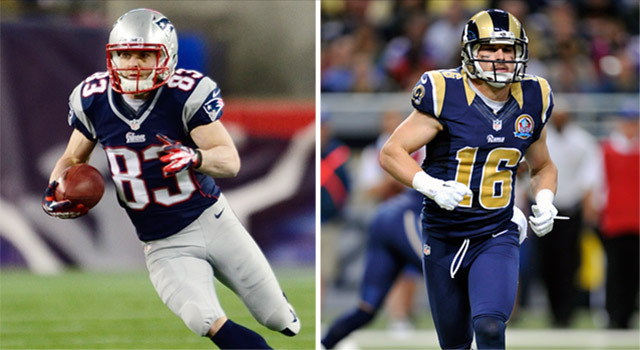 Amendola should be right in his prime at age 27, four years younger than Welker. Now Amendola will be the one to reap the benefits of playing with Brady. Furthermore, the Patriots' offense has also undergone a subtle transformation over the past few years, with New England morphing from a team that used the "10" (one back and four receivers) and "11" (one back, one tight end and three receivers) formations to a team that uses the "12" (one back, two tight ends and two receivers). With the emergence of tight ends Rob Gronkowski and Aaron Hernandez as legitimate superstars, the Pats have relied on more multiple-tight end formations to create mismatches in the passing game. Because Gronkowski and Hernandez can both align as either a conventional tight end or quasi-slot receiver, it's impossible for opponents to keep the proper personnel on the field for matchups. Brady is adept at identifying the weaknesses of every defense, and the Patriots' willingness to play chess with double-tight end formations has given them a significant edge over their opponents. That advantage will remain, regardless of who is playing in the slot. Long story short, the Patriots' offense will continue to rank as one of the NFL's most dangerous, which is enough to keep this team in title contention for years to come.